Call 607-334-6061 or 607-226-1195 for details. Gas Leasing has been updated, expanded, and can be accessed via this link. Doug's Fish Fry will be at the CCFB Office on September 20th from 11:00am to 6:00pm We will also have Alpacas and RootBeer Floats. Be sure to join us! Ag Day celebration was held at the Silo Restaurant 203 Moran Rd. (Just off Rte. 206) in Coventry 11am - 3pm Our Theme was "Sowing Seeds Today...For our Energy Needs Tomorrow. natural gas drilling symposium on Aug. 19, at Lake Huntington, NY Sullivan West High School (6604 Rt. 52), from 6:30 to 9:30 p.m.
A meeting, organized by the Sullivan County planning division, the Chenango County Farm Bureau and Cornell Cooperative Extension, will focus on negotiating a gas lease that protects your property and financial interests. Dairy Day was held on June 21st with a Parade at 11am and events continue at the fairgrounds in Norwich. June 17th (7:00pm) Gas Lease meeting. This meeting was held in conjunction with The Greater Greene Chamber of Commerce. We thank everyone that helped to make it a successful Fundraiser! Our 52nd Annual Meeting, was held at "The Silo", Greene, NY. We held a Gas & Oil Leasing public information meeting on May 2nd at the Norwich Senior High Auditorium at 7pm. Call the CCFB Office (607-34-6061) for more information. June Dairy Day will be held on June 16, 2007 at the Chenango County Fairgrounds. The AFBF (American Farm Bureau Federation) Annual meeting was held at Salt Lake City Utah January 7-11. We won our 10th CAE (County Award of Excellence) award and had a display there. We won in the Policy Implementation category for 25 X '25 (Agriculture will produce 25% of the energy needed by the year 2025) - Community Anaerobic Digester. The power line issue from our side of the fence. thank you for Joining us Thursday, June 8th. Chenango County Farm Bureau has received its 9th American Farm Bureau (AFBF) County Idea Exchange Award (County Award for Excellence ) for the program "Creating a Highly Visible and Effective Farm Bureau (using old and new technology)". 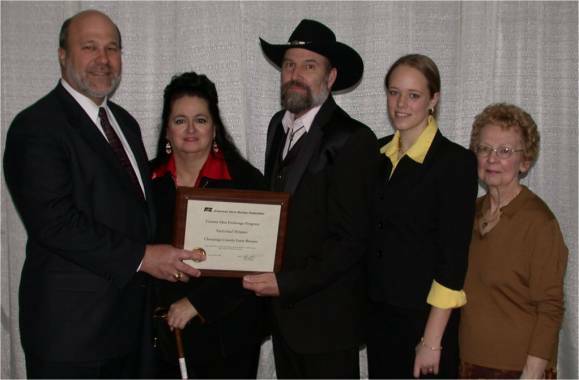 We showcased this program in Nashville Tennessee at the January 2006 AFBF Annual Convention. Grand Opening: Visit us at our "NEW" Farm Bureau Office. 6083 State Highway 12N, Norwich (just north of Norwich, across from Ossie II restaurant, next to the Exxon gas station). Hundreds attend Chenango County Farm Bureau Grand Opening, ribbon cutting, and ice cream social. CCFBs new office on Rt 12 north of Norwich provides a visibility and a central location for their many endeavors, with future plans to provide a starter marketing place for member entrepreneurs. The County Farm Bureau, �Your Link to Agriculture�� is a member driven organization providing a network to the largest industry in Chenango County and NY State, which is open to any one to join. Bradd Vickers, president of CCFB says �The County Farm Bureau (winner of 8 National Awards) has a lot to be proud of, bringing more than $350,000 in to the community plus the multiplying affect, with their annual FB auction, and a major player in such programs as �Bullthistle Bounty�, Venison Donation, and many others�. 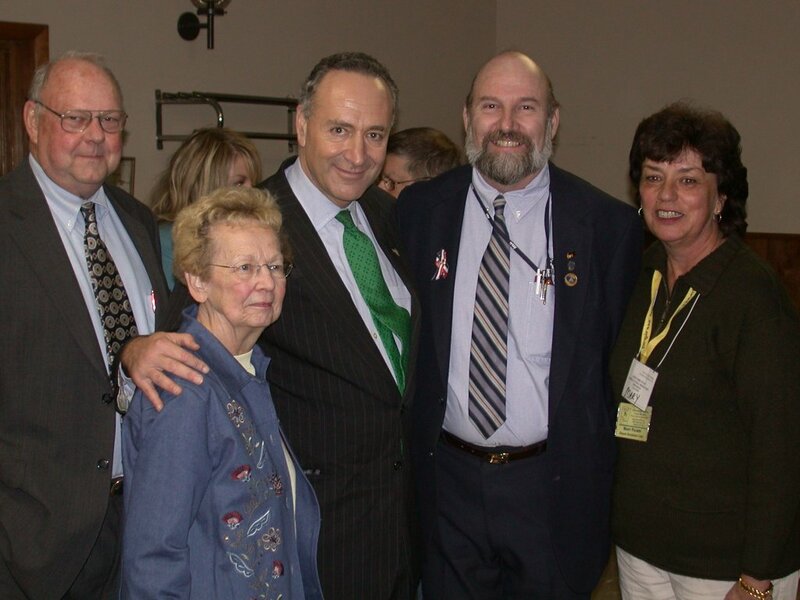 Chenango County Farm Bureau is a key player in maintaining economic stability, enhancing the quality of life, and ensuring a future for the region, making a difference for everyone. Chenango County Farm Bureau is a not-for-profit agricultural organization, dedicated to providing its members with legislative support, educational programs, discounts of all sorts including health insurance and other services to help members improve the quality of their lives; strengthen agriculture and rural America. Thank you for joining us at the annual Ag Awareness day at the Chenango County Fair, which was held on Friday, August 12, 2005....See you next year. June 18th was Dairy Day...Thank you for joining us for the Parade and events held from 11am to 4 pm. We would to thank all of our members and friends that attended our 4th Annual Auction, on Saturday June 25th, 2005., and made it so successful. We recently joined Tompkins County in an "Ag Day at the Mall" event. Marge Secrest and the puppeteers, read ag related books to children at Borders Bookstore. Joined with NFIB in a Legislator Town Hall meeting. We want to thank everyone that joined us on March 18th for our Agriculture Recognition Day! We won our 8th National AFBF County Idea Exchange Program. We displayed it at the AFBF Annual Convention (January 9-12) in Charlotte, NC in January. We also received 3 Honorable mentions for our other programs submitted. Our County Annual Meeting was held on October 20th, at the Fox Run Event Center, with the largest turnout in quite a few years. Milk Punch and cheese was served by the Dairy Princess. A Scrumptious Pork Loin dinner was served. A video entitled "The Year in Review" was presented. Policy was presented and voted upon to be submitted to NYFB. Everyone received door Prizes. Our Ice-Cream/Membership Social ( held on July 23rd, 2004) was a great success. Thank you for joining us. This is our way of adding an extra "Thank You" to our members. We want to thank everyone for their participation in our 3rd Annual Auction, June 19th, 2004. Please keep us in mind for next year. We had a great turnout for SNB Valley Supply Days (Rte 8 north of So. New Berlin, NY) on March 4th and 5th. Over 2000 people attended the event. The postcard campaign to send a message to our legislators was a great success. We received 10 Silver Keys and the coveted Gold Key at the State Annual Meeting held in Rochester, NY. on Wednesday, October 15, 2003. Milk Punch and cheese was served by the Dairy Princess. A Scrumptious Pork Loin dinner was served. A video entitled "The Year in Review" was presented. Policy was presented and voted upon to be submitted to NYFB. Everyone received door Prizes. 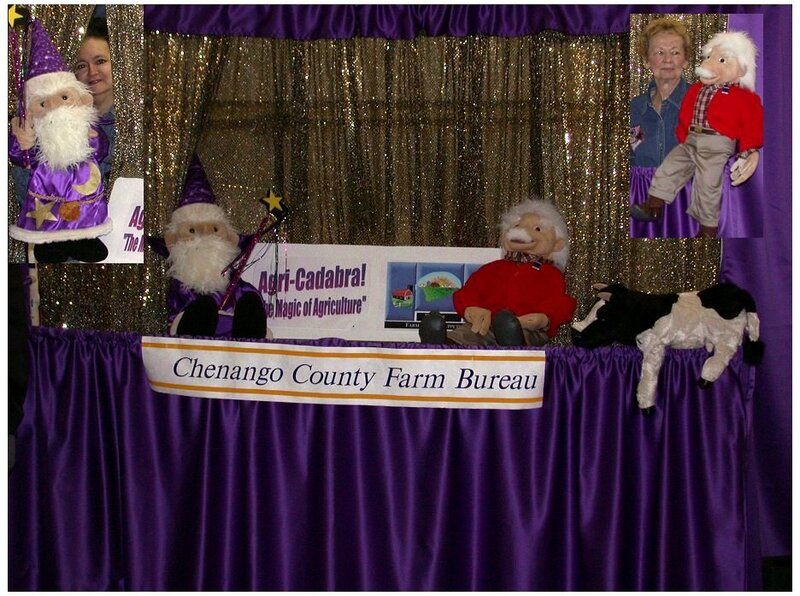 "Agri-cadabra -The Magic of Agriculture". American Farm Bureau Federation (AFBF) president Bob Stallman (left) presents Chenango County Farm Bureau their seventh consecutive County Idea Exchange Program award. 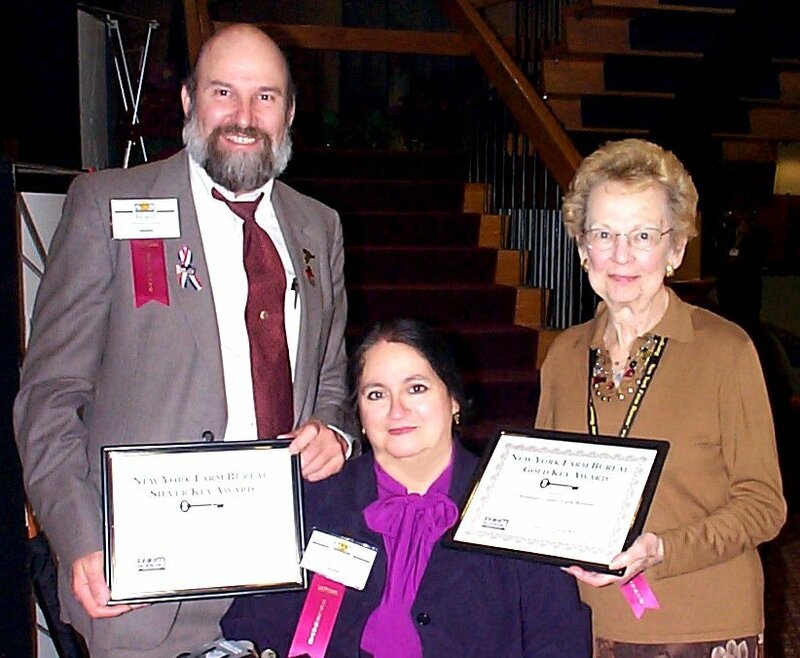 The award was presented to Rainy Collins-Vickers, Pro-Ed Chair; president Bradd Vickers (center); Georgianna Rowe, Young Farmer Rancher Chair; and vice-president, Marge Secrest. The 84th American Farm Bureau Federation (AFBF) annual convention was held in Tampa, Fla. The idea put forth by Chenango County Farm Bureau (CCFB), �Burn, Bury or Recycle�, was a project created to address the best methods for disposing of agricultural plastics used in greenhouses, big-bale wrappers, etc. 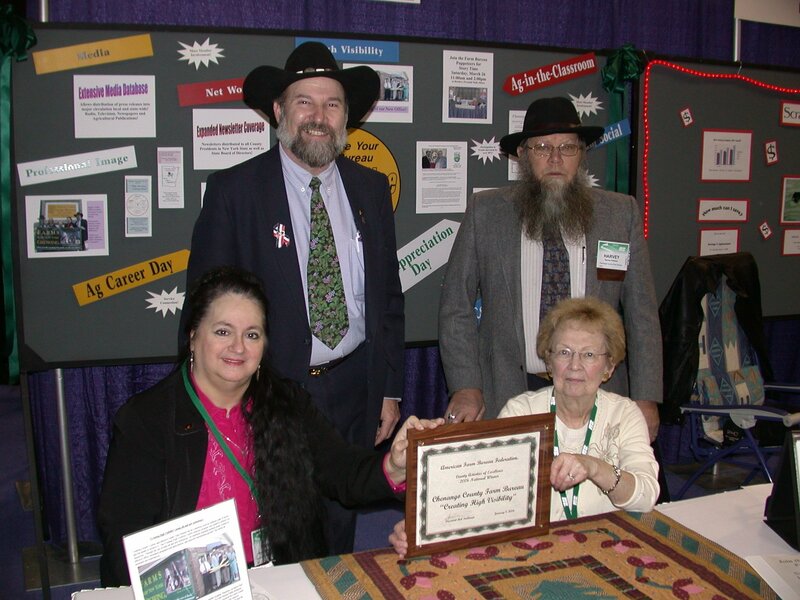 The CCFB representatives presented their seventh consecutive award-winning program at a booth on the show case floor, to the nearly 5,000 members from 50 states and Puerto Rico that attended the convention. 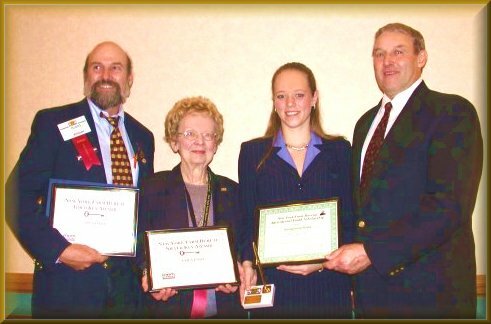 Bradd Vickers (CCFB President) and Marge Secrest (CCFB Director) receive Silver and Gold Key Awards and Georgianna Rowe (Chenango County) receives the State competition Award for the Youth Scholarship from NYFB President John Lincoln. Georgianna will be going to Florida with us for the AFB Annual Convention. CCFB Fruit & Nut Sale Fundraiser. We would like to thank members and friends of Chenango County Farm Bureau for your participation in helping us with the fundraiser. We were able to almost double our profits last year. Please keep us in mind for your holiday gift shopping. We have a 2003 calendar of agricultural events available on the Net! Click on the Monthly Calendar link to view each month of the year (active web links are provided whenever possible). Chenango County Farm Bureau is doing. The printed version of "The Year in Review" calendar featuring events we have participated in is available on a limited basis (for $15.00 to cover printing costs).